Google's Cardboard VR headset is great and getting better. Now, you can tour Street View using its budget virtual reality hardware, too. 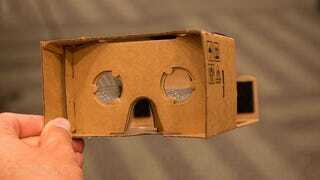 A new feature in Google Maps for Android allows Cardboard users to use a VR mode in Street View. You just have to double-tap the navigation circle in the lower right corner of Google Maps, and then the app throws up the side-by-side images required for the VR headset to work. Voila, you're surrounded by the city streets.